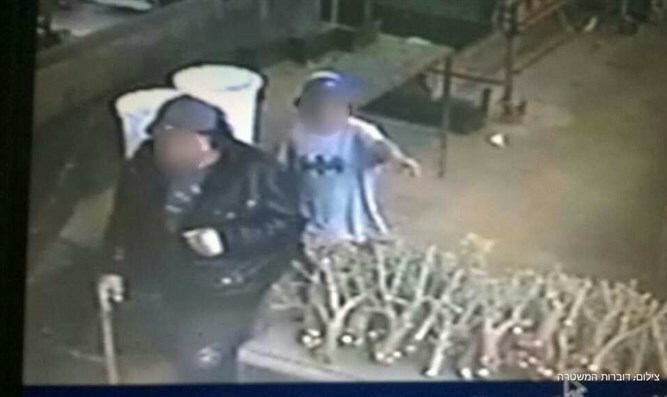 Man caught using 9-year-old son to help commit robberies. Border police arrested a resident of Netanya on suspicion that he used his 9-year-old son to carry out thefts for him. The suspect, a man in his 40s, came to the living quarters of foreign workers in a community under the jurisdiction of the Emek Hefer Regional Council, accompanied by his young son. The suspect and his son also broke into the workers' premises and stole thousands of dollars, a laptop, an iPad, and many other items which belonged to the workers living there. The police were able to locate the suspect and arrest him thanks to a quick analysis of security footage of the break-in. He was still wearing the clothes seen in the film footage. It is believed that the suspect had used his son to commit other robberies, having found the use of his son to be a successful method of stealing. Details of the affair were given to the child welfare authorities. The police said that the involvement of the child made it a most serious case. "The solicitation of a minor to commit a felony is a serious criminal offense, and the police will act to ensure that the perpetrator is punished to the full extent of the law." The task leader added: "It is unfortunate that a 9-year-old boy was raised and educated in the world of crime and delinquency. This could affect him negatively for life."